My parents are really crazy. They’re always talking about food. And music. And wine. This may be TMI (too much information) but ages ago I had some problems with being a bit ‘blocked up’. So I started having prunes every morning. A habit I’m still loving. Some mornings I just have toast with Kerrygold Irish butter. Actually I think my mum changed her mind about letting me eat gluten. For ages she used to give me this gluten-free bread which was OK but I’m much happier when there’s real sourdough in the house. Other mornings it’s yoghurt. Even though my mum makes her own yoghurt, like any self-respecting kid, I’d prefer flavoured yoghurt with cartoon characters on the label. Between you and me I’m surprised she buys it for me. Last week we had some friends stay and their little girl, Sofia had this really yummy muesli. So Mamma and I made our own muesli on the weekend and it’s my new favourite breakkie! Especially with the sultanas, dates and prunes (yep still lovin’ the prunes). If there’s black pudding or bacon or sausages, I make a bee line for the pork products! Every now and then I’ll have some eggs (scrambled are my favourite) but I’m not ready to have them every morning like my folks. OMG and we had the best breakfast the other day… Potato rosti. So so good! Almost as good as potato chips (my all time favourite food after dark chocolate). Most days we have leftovers from dinner which is fine by me. Especially leftover pasta or potatoes. On other days I have cheese on toast sometimes with some calabrese salami (so good!). My favourite cheeses are Parmesan, Manchego (from Spain) and Ossu Iraty (from the Pyrennees). And I’ve recently been enjoying cheesey chickpeas and these beans with rosemary. I think my mamma wishes I could eat canned fish like her sardines, tuna or salmon. But the last few times I ate fish it made me sick – hopefully something I’ll grow out of. If I’m still hungry I love eating peanut butter on a spoon. My mamma is working on a new sugar-free baking book at the moment which is awesome because it means there are always tasty treats in the afternoon. I especially love her brownies but this moist chocolate & zucchini cake is really good too (even though it contains vegetables). Since it’s Summer here at the moment ice blocks made with pureed fruit are one high rotation. The mango ones are my faves but the watermelon and the cherry and yoghurt were pretty tasty too. In the last month we’ve started having family dinner all together. It’s way more fun and I’m finding I’m getting to eat a wider variety of foods. Mamma and Dadda always make me have ‘one little taste’ of everything on my plate. Luckily there’s still always something on the table that I love to eat like spuds or pasta or sweet potatoes or fried rice or tortillas. So I’m not forced to eat the kale or cauliflower or sauerkraut or broccoli or other crazy veggies my mamma loves. My little brother Finbar is still a baby. He can’t tell you what he eats so I’ll fill you in. Mostly it’s the same as me but he just uses his hands and makes a really big mess. Like food goes everywhere. Although now he’s nearly one he’s getting more in his mouth and less on the floor. Mum usually gives him some fruit at the end of each meal. Blueberries are his favourite but he also loves raspberries, strawberries, mango, watermelon, pears, peaches, kiwi fruit, oranges. Yeah he pretty much eats all fruit, so my folks are always calling him our ‘little fruitarian’. Anyway I’d better get back to playing with my Lego before anyone notices I’ve been using the computer. ps. Did you enjoy reading this? Tray bakes like this are brilliant for family dinners because you just pop everything in the oven and let dinner practically cook itself. Especially great on those evenings where there are a lot of demands on the cook’s attention! They’re also great because you can load up the plates of any little (or large) carb-lovers in the house and save the other parts for the low-carb fans. 1. Scrub and halve potatoes and pop in a pan of water. Simmer until just cooked, about 15 minutes. 2. Preheat your oven to 250C (480F). 3. Drain spuds and place in a roasting pan with the chicken and rosemary / thyme. Drizzle with oil and sprinkle over some salt. 4. Roast spuds and chicken for 15 minutes. 5. Add snow peas and cook until everything is well browned and the chicken is no longer pink in the middle. Serve in the middle of the table for everyone to help themselves with your sauce of choice on the side. lower carb – replace spuds with 1-2 heads broccoli or 1/2 cauliflower chopped into florettes (no need to boil first). 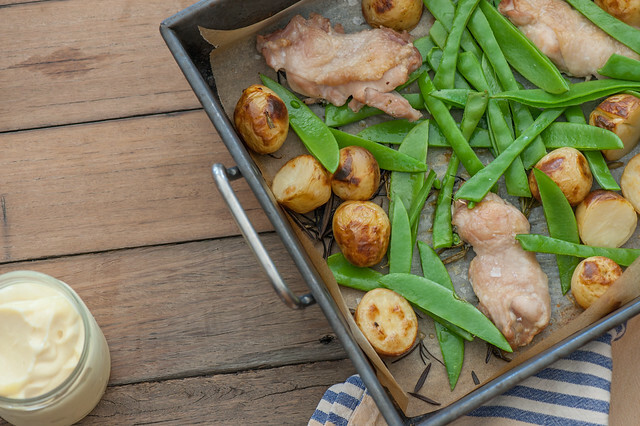 lemony – halve a lemon and roast with the chicken and veg. Squeeze over the lemony juices before serving. vegetarian – replace chicken with a truckload of veggies! I’m thinking mushrooms, eggplant (aubergine), capsicum (bell peppers), zucchini, broccoli, cauliflower. Just make sure they’re chopped small enough so they’ll cook quickly. I’d serve with some roast almonds or other nuts for extra protein. garlicky – pop a few unpeeled cloves of garlic in with the chicken. carb-lovers / more substantial – increase the spuds or serve with crusty bread and butter. Hi, Fergal. Yes, we would love to hear more about your meals. Tell your mom! Love this, Fergal! My little ones are 2.5 and 2 months so soon I’ll be feeding two as well, and I’m always looking for new ideas for my 2.5 year old. This was fun to read. I don’t have little one’s so not much practical there for me but fun nonethesame. You might include occasionally a description of your “food day” – that would make interesting reading as well. 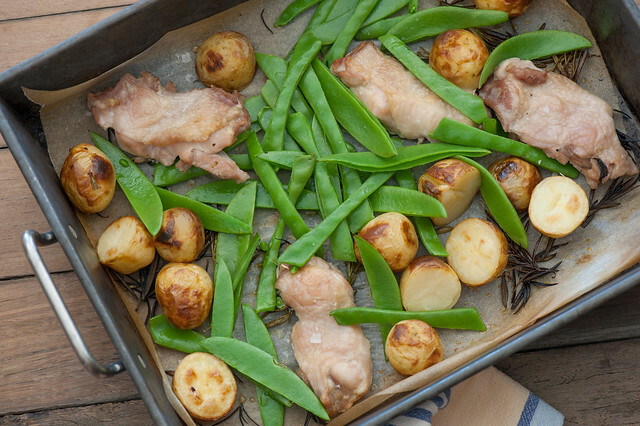 The sheet pan dinner looks good – and I’ll lose the potatoes. Love hearing from you Fergal. It’s an interesting point of view from a child your age. Love to hear more. You are gonna be just like your Mom. Well done Fergal! More please! Keep it up – loving the blog ? I enjoyed reading from the boys’ perspective. I wonder what my boys (almost 11, and 4.5) would write? Hmm..
You’re one lucky little dude, keep up the blogging! Good to hear from you Fergal – you talk/write a lot like Mamma. I’d love to hear more from you. Hi, Fergal! Great writing for your first time blogging, to help Mum out! Keep it up, great to hear what you enjoy – and your little brother too! Ooh…more please Jules! I love the recipes that are whole family friendly. And I love hearing from Fergal. He knows his stuff!! Way to go, Fergal! Love hearing from you. Lucky you, writing & baking like your mum. I like just about everything you like, Fergus — though I like some veggies too. Keep writing! Love it. Been getting my life back together and will be for a while. Never having been the Mum before I never had to cook. With two boys under 6 food prep has moved up the priority list. What a cute post and it is so good that you are teaching those little boys healthy eating. Can I ask where do you get Kerry Gold Irish Butter in Australia? I get it from the Ainslie IGA in Canberra Kerry and my deli stocks it too…. So worth the extra $! Hi Fergal, thanks for sharing what you and Finbar like to eat. My 3 month old baby still loves her milk and formula but soon enough she will be interested in what you guys have been having too. Looking forward to your next post. Good job Fergal! I hope you keep hopping on momma’s computer to tell us more! Clever Jules. Quite a literate kid for his age. Happy to be a test cook. Very interested in your next adventure. Have been looking for a good chocolate and zucchini cake as my other three recipes don’t hit the spot. What size eggs do you use? I buy large eggs at the market so I need to compensate eg when making choux pastry. If you are using 55 or 60 gm and mine are over 70 I need to adjust. If you use big eggs then no probs. Keep up the good eating Fergal. Fergal, lovely to hear from you! Great work having a taste of everything on your plate. ? I am going to share your post with my Boys (8 & 4.5). I think they will enjoy it as much as I have and it may just inspire them to try a few more things too! Keep up the great work. ?? My kids are the exact same age as yours so loved reading this. Do they ask for snacks? Are you still nursing? They dont usually ask for snack Jennifer… Occasionally Fergal does and I’ll give him some peanut butter or a handful of cashews and get him to sit at the kitchen bench to eat them. Kids walking around the house with food drives me crazy! Well done, Fergal! Loved reading your post. Keep it up!! Well, Fergal, you might want to look into getting yourself an agent. You write well and use words simple enough for the Yanks in America to understand. A few more recipes would be welcome. Thank you! Fergal, my great grandson is 2, and my granddaughter, like your mum, has always given him a taste of everything his parents eat. Now he devours everything on his plate, especially cucumber and lettuce. You have a clever mum (and I love her recipes). Keep on blogging!! Good show, Fergal! I enjoyed reading your food commentary about you, Finbar, Mamma and Dadda. Can’t wait for your next report. Are you learning to cook and bake? You seem to already be an expert taste tester. Love the insight from Fergal! I’m so sorry kids, that your mom doesn’t know (or has chosen to ignore the reports) that processed meats, including bacon and ham, (which come from cute, defenseless little piggies who are raised only to be slaughtered, and whose living quarters are as harmful to the environment as car exhaust), have been proven to be carcinogenic. I’m sorry to be so graphic here, folks. But, if we are going to promote good health and responsible eating practices, please research the affects of factory farms on the environment, and the harmful effects of eating animals, in general. There will come a time when eating farm animals will no longer be the norm. Please consider starting now, especially if you are concerned about your health. Don’t mean to be a Debbie Downer, just interjecting another perspective. Thanks for this reminder Tara! I’m well aware of the links between processed meats and cancer and do use them more as a treat these days. And we are getting most of our meat direct from the farmer at our local markets or from butcher I trust. I’m just as against factory farms as you are. Great job Fergal! I’d love to read more. Loved hearing Fergal’s opinion!! Cute article! Hi Fergal, Thank you for sharing what you eat with us. It is great that you enjoy your Mum’s lovely dishes. have a good time ?? Thank you so much for the “spoonful of peanut butter” comment! I do that when my daughter decides at bedtime she’s suddenly hungry. Protein, right? Protein, good fat AND fiber… peanut butter is the best Cherie! Please keep breaking into Mum’s computer! Sometimes we big people take ourselves and work so seriously. I love hearing about mealtime from your point of view. Two thumbs up! Loved this! Would love more updates from Fergal and Finbar! Wow Fergal, you sure do live the high life! You’d better get used to a more carnivore orientated diet though for when you come to visit uncle Dom. I’m not even sure if prunes exist in Katherine! Keep working on those eggs too buddy, they are on high rotation around these parts. As is beer – but don’t mention that to mamma! Miss you folks – I hope you’re being nice to Finbar….